OS X & GNUstep. A new version, 1.0 BETA9, is now available. Is PikoPixel listed in directory.fsf.org? If not, it would be good to enter it. > OS X & GNUstep. A new version, 1.0 BETA9, is now available. An update for PikoPixel 1.0 BETA9 is now available: 1.0 BETA9a. >> OS X & GNUstep. A new version, 1.0 BETA9, is now available. > An update for PikoPixel 1.0 BETA9 is now available: 1.0 BETA9a. An update for PikoPixel 1.0 BETA9a is now available: 1.0 BETA9b. Fedora, FreeBSD, Gentoo, Raspbian, & Ubuntu. the edges of the maximized window. A new version of PikoPixel has been released: 1.0 BETA9d. Very cool Josh, congrats on the new release! Arch users should keep in mind that due to a bug in the current release version of gnustep-back involving freetype2, Pikopixel will not work correctly on Arch because of this. I've messaged the maintainer of the gnustep-back package but it seems he hasn't fixed the issue yet. In the meantime, you can add the following line to your gnustep-back PKGBUILD during reinstall and trick it into compiling correctly. Put it in the Build() block, right after the cd command. 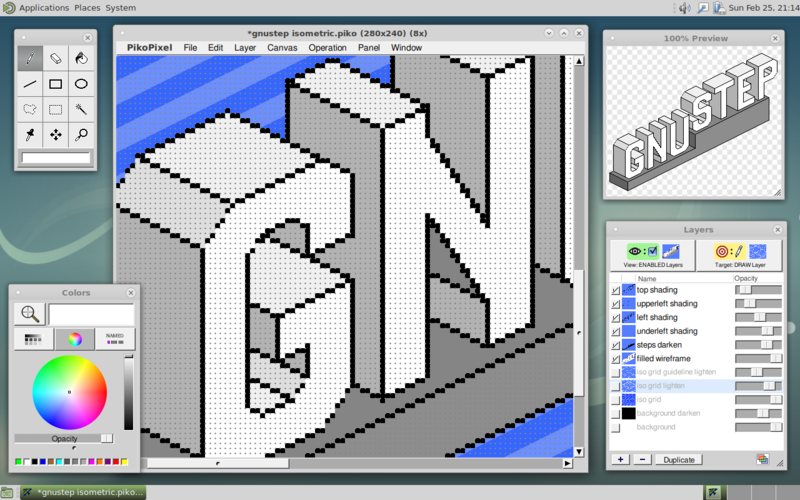 PikoPixel is a free, open-source (AGPLv3) pixel-art editor for Mac OS X & GNUstep. A new version, 1.0 BETA9, is now available. 1.0 BETA9d fixes various UI issues when running under the following environments: Budgie, Cinnamon, GNOME, Pantheon, Unity, Window Maker, & Xfce. that it has its own and overrides GNUstep defaults..
sets my Rik theme as it is the default one. Which is more annoying is an incompatibility with PikoPixel and the Rik. theme for me : it crashes at startup. reimplemented in Rik and Pikopixel, right ? Anyway, Pikpixel is still very impresssive and the new theme is very nice. > now that it has its own and overrides GNUstep defaults..
> instead of the default one. Which is sensible but a little tough. > default theme", which sets my Rik theme as it is the default one. you to change themes, so I'll look into this. lets you switch to a different installed theme). > Rik. theme for me : it crashes at startup. > the context menu of GWorkspace). YES] to update the button. and stopping animation when the notification was received).